Description:Used 2000 Kawasaki Kl650 A Military for sale - Call with 35,055 miles. Online Auction #2248-384 (Ends 5.3.19) Online Auction for Government Surplus - Auction Ends 5.3.19 - To view auction details go to www.govdeals.com and "Search For" 2248-384. Click the QAL box and then hit search. GovDeals.com is the online platform where you can bid on and buy government surplus. Price is subject to change at any time during ongoing auction. 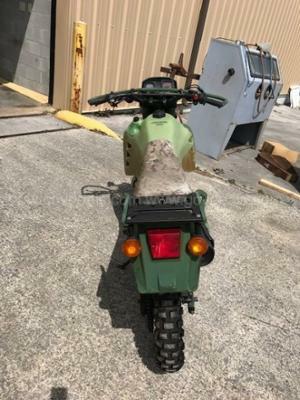 2000 Kawasaki KL650-A, Diesel Conversion - govdeals.com 2000 Kawasaki KL650-A, 651CC. With the HDT-USA diesel conversion. 400 miles and a re-manufacture date of 01/2009. Motorcycle is operational at this time. Being sold as-is with a bill of sale only. Note: Please inspect items prior to placing a bid. Inspections are by appointment only. 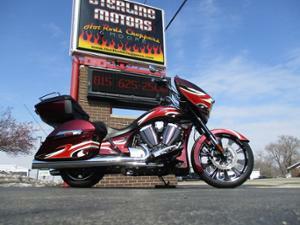 Description:Used 2016 Victory Cross Country for sale - Call with 10,691 miles. Online Auction #3685-341 (Ends 4.26.19) Online Auction for Government Surplus - Auction Ends 4.26.19 - To view auction details go to www.govdeals.com and "Search For" 3685-341. Click the QAL box and then hit search. GovDeals.com is the online platform where you can bid on and buy government surplus. Price is subject to change at any time during ongoing auction. 2016 Victory Cross Country. This bike runs good and looks good. There are a few holes in the rear box and front where emergency lights were. This was a police motorcycle that we have had since we purchased new. 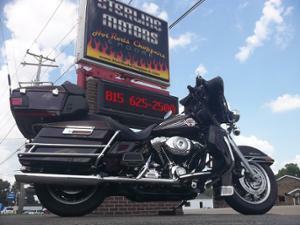 Description:Used 2015 Harley Davidson Flhr Road King for sale - $14,900.00 with 1,115 miles. 2015 H-D Road King with 1,115 miles The ‘15 FLHR is a touring motorcycle for the rider that prefers the look of a classic windshield instead of a fairing. Features include the high output Twin Cam 103” engine, a bright halogen headlamp, Impeller cast aluminum wheels, hard saddlebags and an easy to read speedometer. Its air adjustable rear suspension and a comfortable seating position are perfect for long distance comfort. This particular example is a one owner bike that was optioned in Mysterious Red Sunglo and Blackened Cayenne and currently has just 1,115 miles. It has been nicely optioned with a Boom Audio 2 speaker sound system, a quick release back rest and luggage rack. It has also been upgraded with a Stage I air filter, a Vance & Hines Fuel Pack and it sounds just plain nasty ripping through its Vance & Hines true dual exhaust headers with performance mufflers. The bike is in perfect condition as would be expected considering the mileage. We have priced as an average mileage bike with no options so if you like what you see you better pick up the phone before someone else does! 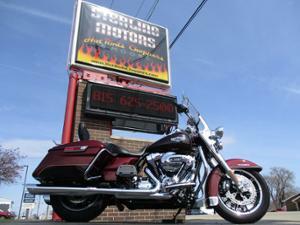 Description:Used 2008 Harley Davidson Flhtcu Ultra Classic anniversary for sale - $9,900.00 with 26,601 miles. 2008 H-D FLHTCU Ultra Classic Anniversary The FLHTCU Ultra Classic is a luxurious motorcycle fully-equipped with touring amenities such as an electronic cruise control and a CB radio/intercom which are all standard equipment. New for 2008 you will find Brembo brakes with available ABS braking. You will also find the 08’s have a 20% larger gas tank (6 gallons) with new console styling, a new electronic throttle control, improved battery access, a fuel range indicator, a reshaped seat for more comfort, fairing mounted adjustable wind deflectors and an isolated drive system. You will also appreciate the rubber mounted 96 inch Twin Cam engine mated to the 6 speed Cruise Drive transmission. This particular example is a 105th Anniversary Edition which only came in Anniversary Copper Pearl and Vivid Black and is adorned with special badging, spoke wheels, ABS and the Smart security system. It has been upgraded with custom grips and pegs and it sounds awesome ripping through its performance exhaust. It currently has 26,601 miles and everything works as it should. With a KBB value that is well over $1,000 more than our asking price this beauty is sure to move quickly. 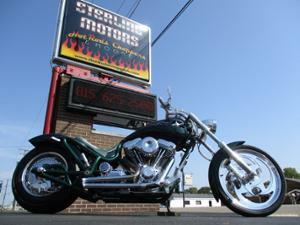 Description:Used 2005 Harley Davidson Flhtci custom for sale - $9,900.00 with 63,203 miles. 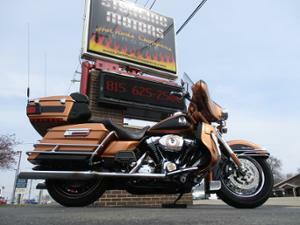 2005 H-D Classic FLHTCi Custom This sweet bagger started as a bone stock FLHTCi with 63K miles last fall. Over the course of the winter our “Go-to-Guy” at Fortune Cycle gave this beauty a new lease on life. The engine was completely rebuilt which included new Andrews 26 cams, new cam bearings, a new cam chain tensioner with guide, new Screamin’ Eagle adjustable push rods and lifters. Of course all gaskets, fluids and filters are new as well and it sounds just plain nasty ripping through its new 2 into 1 Thunder Header. The battery, cables, plug, plug wires, brakes and tires are all new too. It has been upgraded with a quick release low profile tour pak and lower fairings all of which were painted to match the rest of the bike including the inner fairing. It now rides on a set of Street Glide rims front and rear with a custom built seat with matching backrest and a low profile smoked windshield giving it the Street Glide look. There is a nice list of chrome upgrades which include the 12” mini apes, the front end, the front axle covers, the voltage regulator cover, the windshield trim, the gauge bezels, the speaker trim rings, the diamond plate dash, the push-to-lock gas cap, the hand controls housings, the adjustable passenger pegs, the grips, the custom shift rod, the rear filler panels and it has new polished front rotors. The head light, driving lamps, blinkers and tail light are all LED and brand new. You will also appreciate the rear air ride which gives it a ride better than stock as well as the Rockford Fosgate Punch 300 watt amp and 6.5” speakers. All said and done over $5,000 was spent on parts alone to recreate this beauty which didn’t include over a 100 hours in labor. If you like what you see you better move quickly as you could not recreate this bike for anything close to what we are asking for it! Description:Used 2000 Bourget Fat Daddy 240mm Custom for sale - $9,900.00 with 6,288 miles. 2000 Bourget Fat Daddy 240mm Custom This gorgeous Bourget originally cost over $60,000 which included over $10,000 worth of custom work done to it. It was a beast to start with its S&S performance built 113” engine fed by an S&S shorty carb that sounds just plain nasty ripping through its custom built exhaust. As if that wasn’t enough the original owner had a custom nitrous system installed which not only looks wicked with its two 1 pound cylinders custom mounted inside the 6 gallon gas tank but it gives this bike the potential to scare the daylights out of you. It was also upgraded with progressive heavy duty softail shocks and it looks wicked with its 240mm rear tire and 21” front rim. It has an inverted front end with a 40 degree rake which perfectly complements the 2 inch stretch in the neck and the extra 6 inches in the backbone. Everything on this bike is chrome, polished or painted and the bike shows like it has 500 miles on it. It currently has 6,288 miles and was just completely serviced at which time it received new tires, new brakes, a new battery, new fluids and filters. She is in perfect working order and is need of nothing but someone to enjoy her. With over $60,000 invested in the build of this bike it is destined to sell as quickly as it moves so if you like what you see you better pick up the phone before someone else does! 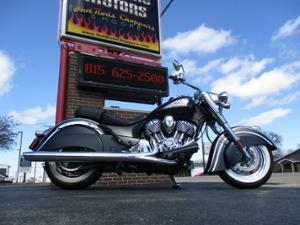 Description:Used 2015 Indian Chief Classic custom for sale - $14,900.00 with 8 miles. 2015 Indian Chief Classic Custom with 8 Miles Not only does the Chief Classic have impeccable styling with its vintage lines, abundant chrome, and beautifully valanced fenders but it is also a mechanical gem, based on a rigid aluminum chassis and an air-cooled Thunder Stroke 111ci V-Twin with ample power at any rpm. Instrumentation is simple and the riding experience is excellent with more cornering clearance than you would expect of a cruiser with floorboards. With rider amenities such as ABS, cruise control, keyless starting, electronic fuel injection and an adjustable single-shock swing arm the Classic is well equipped. This Indian Chief Classic oozes refinement and style and all it takes is one ride to understand the warm reception the marketplace has given to one of the best cruiser motorcycles of 2015. This particular example is a one owner bike that was sold new by American Heritage Motorcycles. The owner wanted flat black which was not available so he paid extra to have it painted flat black which is beautifully accented by silver leaf Indian logos on the tanks with matching silver leaf stripes that are pinstriped in burgundy. The day after purchasing this the owner was in a terrible car accident that has left him unable to ride which is why there are no miles on this bike. It was sent to Indian Motorcycle of Liberty who took care of all open recalls. The bike is in pristine condition with no flaws as would be expected of a bike with 8 miles. It has been priced as if it has average miles for a quick sale so if you like what you see you better pick up the phone before it is too late! 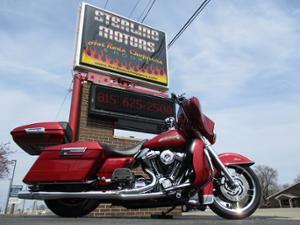 Description:Used 2007 Harley Davidson Flhtcu Electra Glide Ultra Classic for sale - $7,900.00 with 47,250 miles. 2007 H-D FLHTCU Electra Glide Ultra Classic As the ultimate touring motorcycle from Harley-Davidson, the FLHTCU Electra Glide Ultra Classic benefits from the performance of the Twin Cam 96 engine and 6-speed Cruise Drive transmission. With more displacement, lower cruising RPMs and reduced clutch lever effort, the Ultra Classic delivers maximum performance and comfort. An adjustable Tour-Pak, the 80-watt Advanced Audio System by Harman/Kardon, cruise control and full instrumentation are all standard and enhance both the rider and passenger comfort and convenience. The lower fairings feature large vent doors for weather protection and ventilation. Optioned in Black Cherry Pearl this is a two owner bike that has been serviced regularly since day one. It has been nicely optioned with a low profile tinted windshield, 3 windshield pouches and adjustable wind deflectors for the fairing. We have priced this beauty well below the KBB retail value so if you like what you see you better pick up the phone before it’s too late! Description:Used 2015 Victory Ness Magnum Custom for sale - $15,900.00 with 8,048 miles. 2015 Victory Ness Magnum Envy comes standard on the Ness Magnum. This Victory has graphics and paint designed by the one and only Ness Family. Its 21-inch front wheel is the largest production rim on the road. And the 100-watt fairing audio is Victory’s loudest sound system ever. Loud, fast, and impossible to ignore, the Ness Magnum is the ultimate factory custom bagger. This particular example is a one owner bike that was factory optioned in Ness Midnight Cherry and has been pampered since day one. The Magnum boasts a 106ci Victory Freedom V-Twin that delivers 106 ft-lb of torque without any modifications. It is a smooth and efficient engine with a 6th gear overdrive to drop the RPMs and delivers the smooth ride you’re looking for. Not only is this a fully loaded Ness model but it also has a nice list of dealer added upgrades. Upgrades added by Randy’s Cycle include performance cams, a precision timing system, a ¼ turn throttle, a high flow air filter. A Power Commander V and it sounds just plain nasty ripping through its Lloydz performance exhaust. It was dyno tuned by Fuel Moto at 113.05 hp with 117.56 pounds of torque making this bike a sheer thrill to ride. Other notable upgrades include the contrast cut front rim, matching quick release trunk with luggage rack, speakers and amp as well as the ape hangers, handlebar mount and wiring for a Garmin GPS (not included), a USB port inside the right saddlebag, a trailer hitch with wiring and a manual rear air ride system controlled by a hand pump. All said and done over $10,000 was spent on upgrading this beauty making it a true one of a kind. If you could see yourself on this sweet machine you better call us before it is too late! 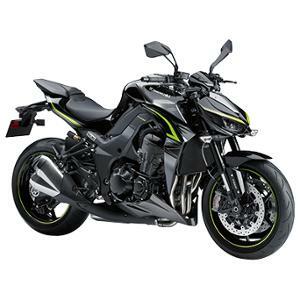 Description:Used 2017 Kawasaki Z1000 for sale - $7,500.00 KAWASAKI Z1000 R Stripped off of all unnecessary flourishes, the 2017 Z1000 R Edition is darker, meaner and more beastly than ever. Equipped with ABS, coupled by brembo brakes and calipers, the Z1000 R Edition boasts of incredible stopping power than can rival even the strongest superbike. 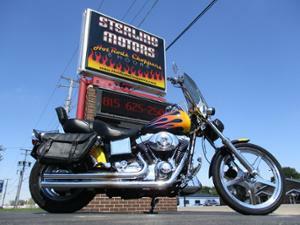 Description:Used 1999 Harley Davidson Fxdwg Dyna Wide Glide for sale - $5,900.00 with 31,703 miles. 1999 H-D Dyna Wide Glide Custom The motorcycles of the Dyna line are considered to be the best handling and most versatile performance leaders amongst Harley's big twins. Their relatively light weight makes them a natural choice as the basis for a hot rod bike which has led generations of customizers to build Dyna’s of every imaginable type and style. This beauty has a gorgeous custom flame paint job with flames that start yellow and fade to red with a blue pin striping that sounds just plain nasty with its Vance & Hines Long Shots exhaust. It has been upgraded with the following H-D additions: Chrome 5 spoke wheels, detachable windshield, tach (w/ visor), lower spoiler, luggage rack as well as 2” extended forward controls. Almost every imaginable option you can think of has been added to this bike with a list of upgrades longer than your arm. Some of the highlights include tear drop mirrors, a speedo visor, tail light visor, Hot Bolt topper kit as well as steel braided cables (& lines). Additionally, you will also find the following genuine H-D chrome parts: grips, pegs, switches, switch housings, levers, tank panel, gas cap cover, lower legs, fork boot covers, axle covers (front & rear), voltage regulator cover, points cover, starter cover, trans door cover, engine to trans cover, top shock covers, master cylinder covers, sprocket cover, lower belt guard, derby cover, petcock valve cover, horn cover, clutch cable cover (& clamps) and a chrome headlight bezel. This particular bike has been completely customized using genuine Harley-Davidson parts almost exclusively with add on parts totaling in excess of $12,000. There are a few very minor flaws which include some flaking chrome on the inner primary, a small scratch in the paint and a small ding in the heat shields all of which are shown ion the photos. With the exception of these minor flaws you would be hard pressed to believe this beauty has 31,703 miles. It was recently serviced by our local H-D mechanic and is ready to roll. We have basically priced this as a stock bike so if you like what you see you better not wait until it’s too late to pick up the phone! 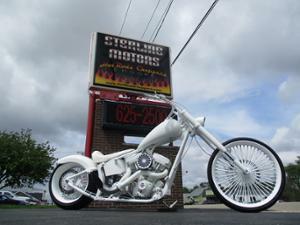 Description:Used 2015 Custom Built Pro Street Chopper White Lightning for sale - $14,900.00 2015 240mm 117” Softail 26” Chopper - White Lightning You are looking at one of the cleanest custom builds on the market. Hand built by Johnny Legend Customs out of Villa Park, IL this one of kind creation is a real show stopper! The gorgeous lines of the DNA softail frame which has a 4 inch stretch in the backbone and an additional 8 down perfectly accents the inverted American Suspensions 8 over front end. The chassis attractively showcases the gorgeous fat spoked 26” front rim which is beautifully complimented by the matching rear rim that sports a 240 mm wide tire. The heart of this beauty is an Ultima 117” V-Twin with a Baker 6 speed transmission and an open 3” BDL primary. It is fired by a Dyna Super Coil ignition which is fed by an S&S shorty carb and it sounds just plain nasty ripping through its FSD 2 into 1 upswept performance exhaust. Almost all of the components used in the build are from Performance Machine and absolutely everything on this bike has been painted or powder coated white except for the few chrome accents and of course the rubber. Not only that but hundreds of hours and thousands of dollars were spent to diamond cut almost every component on the bike. When you look at this bike up close it is truly a jaw dropper. This bike was completed in 2015 and has been ridden less than 1,000 miles since. It was just serviced and everything is in perfect working order. The build cost exceeded $30,000 but we have listed the bike for half of that for a quick sale. If you could see yourself cruising on this beauty you better pick up the phone before someone else does! 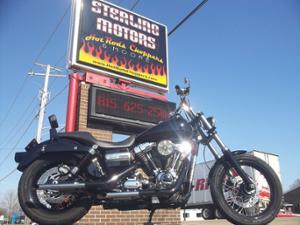 Description:Used 2011 Harley Davidson Dyna Super Glide Custom for sale - $9,900.00 with 8,049 miles. 2011 Harley Davidson Dyna Super Glide Custom For riders who want a head start on building their dream custom motorcycle or for those who just want a little more straight from the showroom floor, the Harley-Davidson Dyna Super Glide Custom model is the perfect bike. This stylish performer’s long, low profile is enhanced by a low slung, two up ribbed seat. Steel Laced wheels and the Fat Bob fuel tank add to the classic look. It has an extremely clean front end which draws attention to the tank mounted speedometer/ignition console. With a nimble frame, Twin Cam 96 engine and smooth shifting 6 Speed Cruise Drive gearbox, the Dyna Super Glide Custom is just plain fun to ride. This particular has been tastefully customized and is all black and chrome. What really sets it off is the long list of items that were powder coated black. That lists includes but is not limited to the triple trees, the lower forks, the rims, the hubs, the levers, the shocks and the heat shields. It has Santee T-Bars with Arlen ness mirrors, chrome switch housings and switches, micro blinkers, Bassani contrast cut grips and pegs and a quick release passenger back rest. It also has a Performance Machine air cleaner and it sounds just plain nasty ripping through its Santee drag pipes. With just 8,049 miles and thousands of dollars in upgrades this sweet ride is destined to sell as quick as it goes so if you like what you see you better call us before it’s too late!